Despite a diminishing quality in his plentiful output, James Patterson's Alex Cross series has remained an annual reminder of all the reasons I became a fan of his writing in the first place. With Cross the Line, the twenty-fourth installment in the series, I'm reminded again of why I keep coming back for more. Patterson's short chapters make for a quick pace, and his characters, when given the proper time to develop, are the relatable kind of people that you can't help but root for. All in all, the Alex Cross series continues to be one that I consistently look forward to reading each year. The novel begins with a lone gunman speeding through the streets of D.C. on a motorcycle. He shoots victims in other cars in a response to their traffic violations. Just as the news of these murders begins to surface, the DCPD takes a huge blow when their chief of detectives is gunned down outside of a grocery store. Alex Cross and his wife Bree quickly arrive on the scene. Alex worked closely with the chief, and the chief was Bree's mentor. Naturally they are both emotional about his death. More so, they are bound and determined to bring his killer to justice. Just as the investigation begins, an even higher priority takes precedence. A commercial-level meth lab has been shot up leaving all those who worked in it dead. Worse, it appears to be the work of professional killers. When another lab is targeted a few days later, Alex becomes certain that someone has started an all out war. As always, he must balance the pressures of family life (his son is beginning college and his daughter is becoming a bonafide track superstar) while facing three high-profile investigations. After a somewhat disappointing previous book, Cross the Line is a return to form for Patterson. While his plot is full of twists and turns and three seemingly disparate cases, they are unified by Alex's unwavering commitment to solve them and even deeper connections that are revealed as the story advances. I always turn to the Alex Cross series for the breakneck pace and thrills, but it his Patterson's focus on Alex and his family that keeps me coming back for more. It is always a joy to see how Alex's personal life has developed over the course of the series. 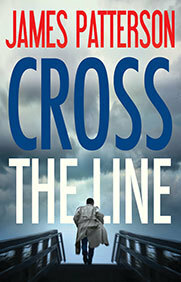 Cross the Line continues that development and strikes a perfect balance between the mystery and character focus. Count me in for the next installment! This entry was posted on Thursday, January 25, 2018 and is filed under Alex Cross,Book Review,Crime,Cross the Line,Family,James Patterson,Mystery,Thriller. You can follow any responses to this entry through the RSS 2.0. You can leave a response. You know I've never read one of the Alex Cross mysteries though I do want to. I suppose I've been putting them off because I've read some of his other novels and they have been very hit or miss. Would you say this is where he really shines? This is one of the few series that Patterson doesn’t employ a coauthor on. By being the sole author, I think it remains his purest and best work. Definitely check out the early books. They are some of his best! I never pass up a good mystery haha. Thanks for stopping in! I stay away from most of his other works, but I’ve always been a sucker for Cross. Most of his coauthored novels have really diminished his brand though. It has been so long since I've read a James Patterson novel! I’m realizing it’s been about a year for me too! I’ll definitely try to not take so long to read the next on. It’s already stacked on my TBR shelf! Believe it or not, I've never read James Patterson! I have no idea why. I've jest never crossed paths with a Patterson book. And I know I would probably love them. Great review! I'm actually surprised about that one! I think you would really enjoy some of his books. I'm really glad you were able to enjoy this one a lot more, especially after the previous one in the series was a bit of a let down for you. It's good to get back to the fast pace and enjoyabe reading! This remains one of my favorite series of all time.